Finally! I've been waiting a while for this one. 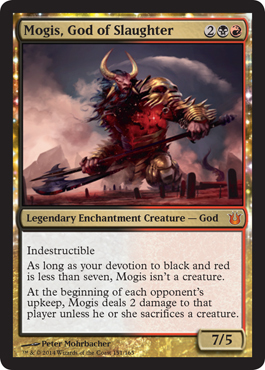 This is our last god for the set. 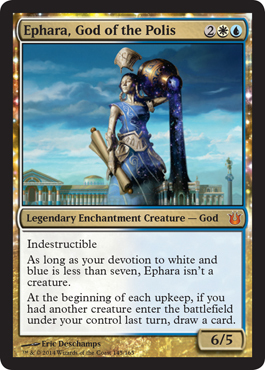 So we have the same details as all the others from this set: Combined devotion of 2 colors is 7 or more or else the god isn't a creature, and then this is indestructible. 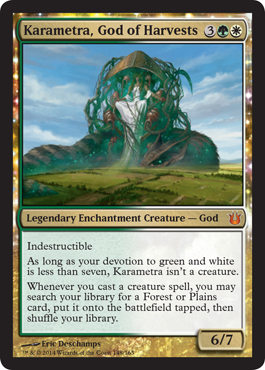 So, we have the god of milling based on your creatures. Tap creatures to mill target player's library based on the toughness of the creature you are taping. 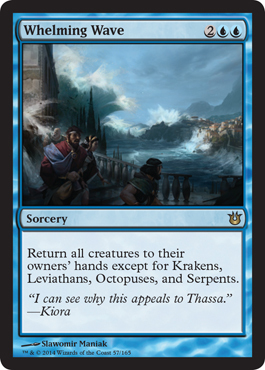 Sorcery speed removal for sea creatures, which falls in with Kiora. 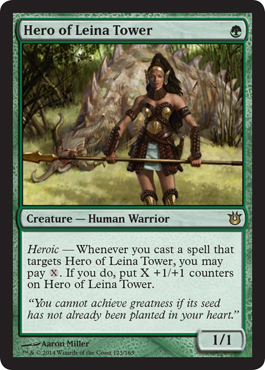 This saves her tokens, but it doesn't save the Merfolk creatures which means Kiora's Follower doesn't get to hang around if you use this. What cards qualify? Here are ALL the cards. 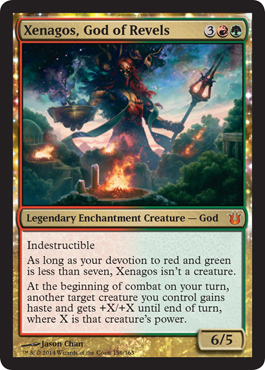 Here are the STANDARD cards, or at least, non Born of the Gods Standard. I think I'm liking Tribute. The art of Epiphany Storm has a similar person in the art, and seems to have the same "visions" or background as Possibility Storm (and the red card color, but that's not the important part here). 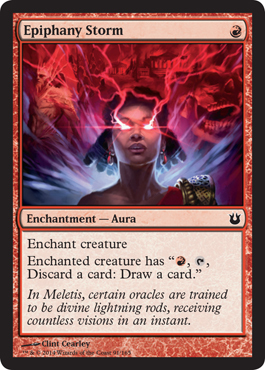 Also, note none of the artists are the same, so did Clint Cearley get inspiration from these cards, or is Wizards so good in the art descriptions of what they want that artists are able to come up with similar art as another artist who did similar work? I'd say a little of both given how similar Brainstorm and Epiphany Storm look. Regardless, I love the art. 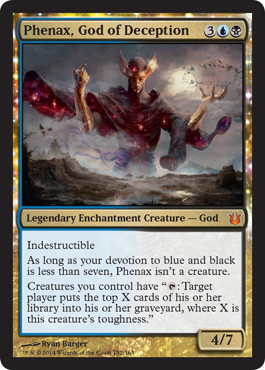 I REALLY want a foil version of that card (I'd also like one of that Brainstorm art, but that art only appeared in the Izzet vs. Golgari dual deck. Hey, there's an idea... completely foil Duel Decks... er, never mind. Completely foil decks is what sunk the Premium Deck Series product line. Poor sales, why pay $30+ for a foil deck? Then we would see something like $40+ for a foil dual deck). This will be an awesome little gem for enchantment decks. Spend extra mana for enchantments, get +1/+1 counters. Sounds good to me. Legendary creatures get +1/+1 for each other legendary creature controlled by you. 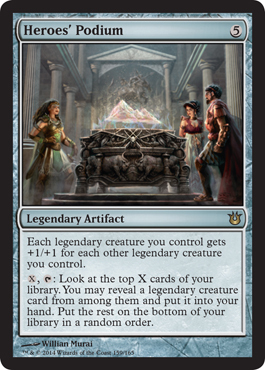 You also get to look at the top X cards in your library, take a legendary creature from that, put it in your hand, then put everything else on the bottom of your library. Not bad, not bad... 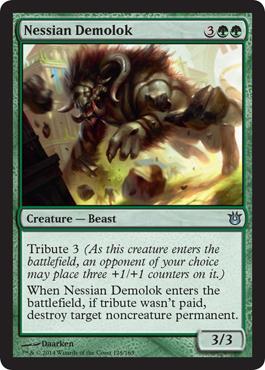 Honestly, I don't see this being a big thing in Standard, but in Commander/EDH, I could see this becoming a staple perhaps.